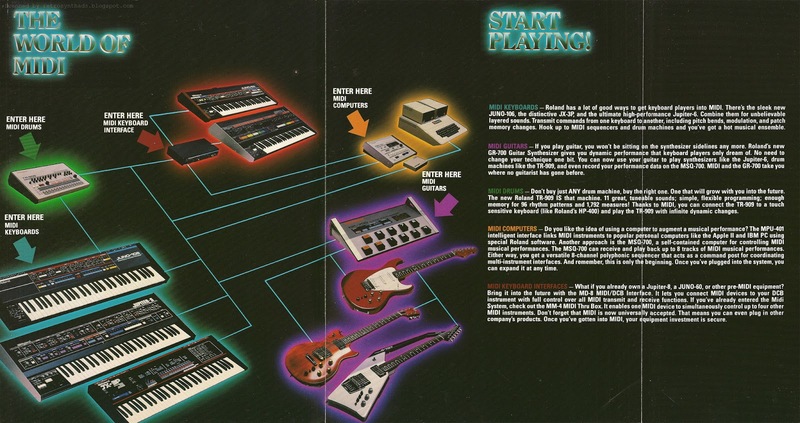 Roland "Enter the world of MIDI" three-page fold-out featuring the TR909 drum machine, Jupiter-6, Juno-106, and JX-3P synthesizers, MSQ-700 sequencer, MD-8 MIDI/DCB interface, MPU-101 computer interface, MM-4 MIDI through box, and GR-700 guitar synthesizer, attached between pages 18 and 19 in the July 1984 issue of Keyboard Magazine. 1984 was a good year. Two words - Sixteen Candles. 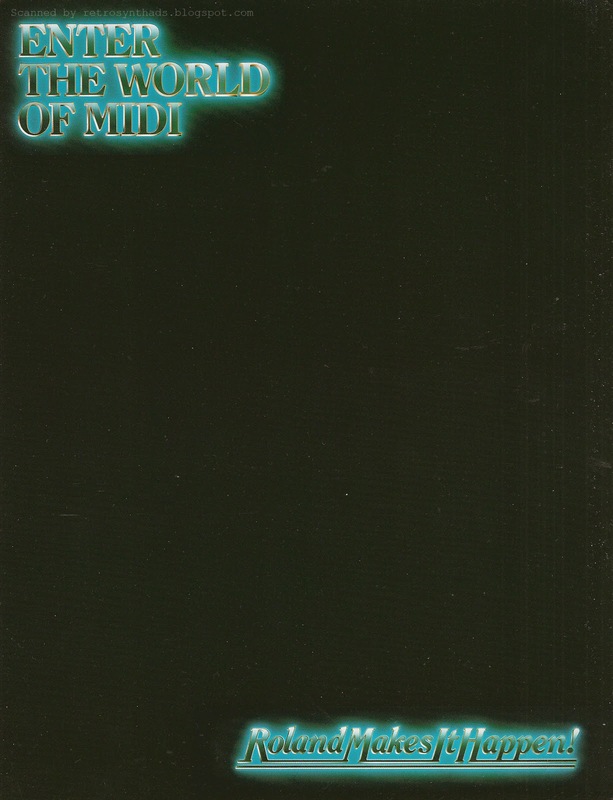 Another reason is that Roland officially announced it *hearts* MIDI with this promotion fold-out piece. Really what else is there to say? What a nice surprise to open up the July 1984 issue of Keyboard and find this tucked nicely between pages 18 and 19. Its a pull-out, but stuck so tightly in there that its more of a fold-out. So that's what I called it. Sure, Roland had a few ads before this featuring MIDI gear, but I think this really was Roland's defining moment - proprietary DCB is out and the MIDI standard is definitely in. So long, suckas! I hope the scan makes sense. 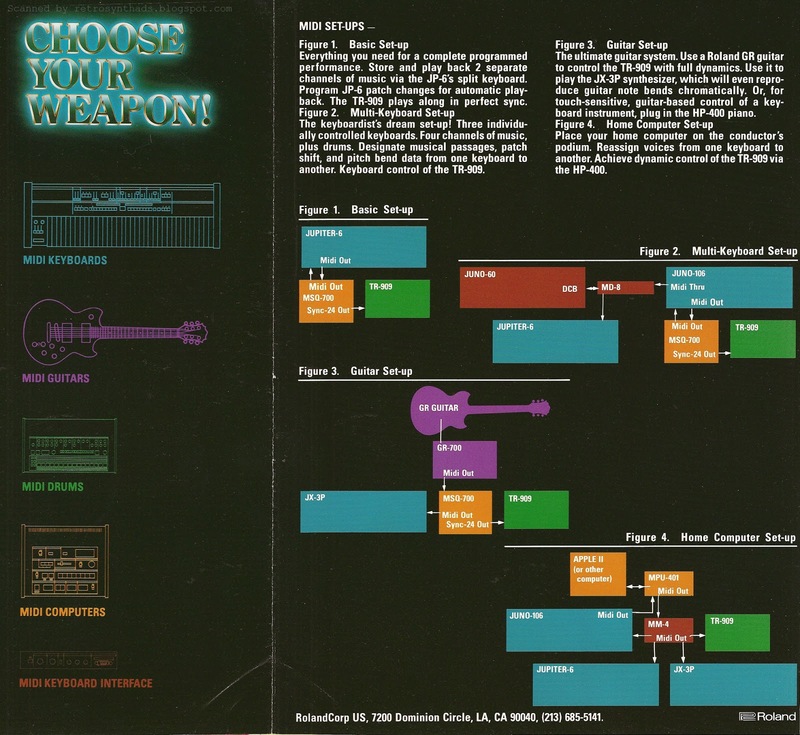 Basically, when you flipped to page 18, rather than viewing page 19 on the opposite page, you would be presented with that first lovely front page with the inviting welcome message "Enter the World of MIDI". Flip the page and you really do enter that strange new world, greeted with two and a half pages of inner-promo-goodness. Then, if you flipped that over, you could view the back-side page and a half fold-out. This is Roland announcing to the world that it has embraced MIDI. And indeed it has. Just look at that list of gear Roland has pumped out since MIDI was introduced to the word - TR-909, Juno-106, Jupiter-6, JX-3P, MSQ-700, MD-8, GR-700, MM-4 and MPU-101. And, lets not forget a few walk-on appearances by none other than the grand-daddy of 'em all - the Jupiter-8, but also a Juno-60 and even an Apple II computer (and PC - both using special Roland software). And if putting all that gear together in one place isn't enough, Roland tied it all together with a gorgeous bow by including an infographic - before the word "infographic" even existed. Just look at the design. Gorgeous black background with a pre-Photoshop neon glow. It's so soothing. I want to just bathe in the glowing light. And best of all - Roland includes not one, but two diagrams. I loooooove diagrams. 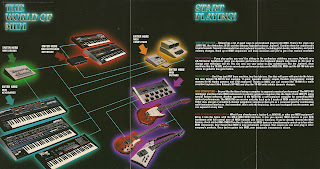 The first includes imagery of each group of instruments, and the second is more of a classic diagram illustrating Roland gear used in a basic set-up, multi-keyboard set-up, guitar set-up and home computer set-up. To make it easy on us readers, Roland colour-coded everything and included a legend on page three under the heading "Choose your weapon!". Roland - it doesn't get much better than this. this is incredible! thanks for sharing!!!!!!! !